SAGITA COM - AVG Internet Security 2014 adalah sebuah program untuk melindungi PC Anda dari ancaman berbahaya jaringan. Blok program virus, trojan, worm, spyware, dan firewall untuk melindungi terhadap serangan jaringan. Jika Anda menggunakan AVG Internet Security 2014 Anda tidak perlu khawatir tentang pencurian identitas, spam atau virus. dll. AVG products are easy to download, install and use, have minimal impact on system performance. 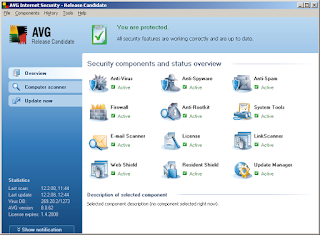 AVG security system certified by all major independent certification companies, such as the ICSA, Virus Bulletin, Checkmark (Lab West Coast Labs). Anti-Virus - find and remove various viruses, Trojans, Internet worms. Anti-Spyware - Protecting your computer from installing spyware and other malicious programs. Anti-Rootkit - protection against hidden threats, spreading malicious content. Anti-Spam - E-mail filtering and deleting spam. Identity Protection - Protection against new and unknown threats. LinkScanner Active Surf-Shield - protection in real time from infected web pages during surfing the Internet. LinkScanner Search-Shield - a mapping of security assessments in real time for all the search results Google, Yahoo and MSN Live. Web Protection and Firewall - a full-fledged firewall to protect your computer while it works on the web. ID Protection - now your passwords, credit card numbers and other personal data are protected from theft. Anti-rootkit: Improved detection of new rootkits Alureon. Antispam: IPv6 support in the anti-spam updates. Core: optimized Check Registry Resident Shield. Core: Corrected an error while scanning the registry. Core: how to detect malicious programs have been optimized. Core: number of false positives is reduced. General: Added support for exceptions to Anti-Rootkit. Itu tergantung selera masing-masing individu kak. avg 2014...??? di site resminya aja masih avg 2013... ni asli ato palsu ni...?